I was born in Elkhart. When I was a toddler, maybe 3, my mom and I moved to Goshen after she and my father divorced. Her family had been very centralized in Elkhart, and slowly sort of migrated to Goshen in the 1980s and ’90s. I am the director of human resources for a non-profit organization called Ballotpedia, which is the encyclopedia of American politics. I also do administration and business operation. It speaks to Goshen as a community that I work remotely, and yet my husband and I live here. I went to Model Elementary School and then the middle school and graduated from Goshen High School in 2006. I went on and received an undergrad degree and have a master’s in library science. I really love public education, and I really love Goshen, and I love Goshen schools. That prompted me to become interested in possibly running for school board. I didn’t get elected the first time I ran, but last summer there was a vacancy on the school board, and I applied and was appointed. I ran again in November 2018, and now I’m serving my own term. My husband and my stepson and I all love the food options there are in Goshen. We love Pizzeria Venturi and I love Noodlelicious, Goshen Brewing Company and Common Spirits – we just love to get in all those kinds of places a couple times a week. Other than that, my husband and I really love to travel, and we find Goshen to be a great base for that. You’re close to Chicago, you can get to Indianapolis, but the cost of living here is really low so it makes doing that more possible than if you tried to live in one of those metro areas. Linway Cinema is special to me; my first job was there. I also remember very well when Goshen did not have any theater like that. I’m also a member of the Maple City Market board. I think it’s really special that a community of our size has a co-op. My husband and I chose to come back and to settle in Goshen. It’s a small community and I would say it’s a very close-knit community, but it’s also incredibly vibrant. You see it in initiatives like First Fridays – which, again, didn’t exist when I was growing up – to the really vibrant businesses that have moved into downtown and the revitalization of downtown. So much work has gone into these buildings and to attract good businesses here. Goshen is also very walkable – there’s a great trail system and sidewalk system. 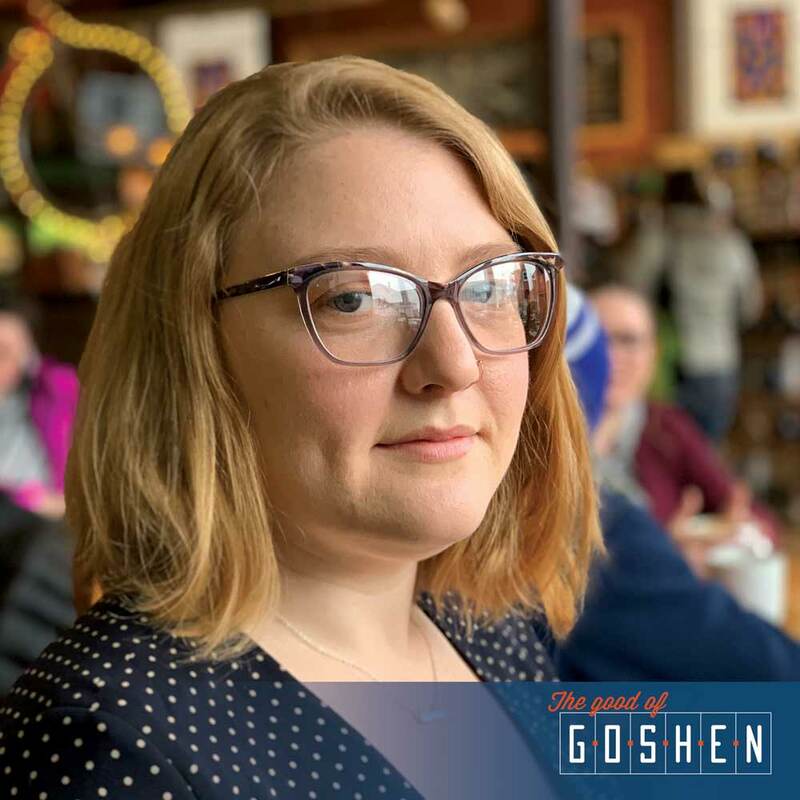 All of those things set Goshen apart, not to mention having a really diverse community, a really thriving Latino community that I’ve seen grow throughout my time in Goshen. It’s a really unique place.